Worldwide cancer is the major cause of death. Almost 8.8 million people died due to different types of cancer such as lung cancer, liver cancer, breast cancer, stomach cancer, blood cancer etc. in 2015. Government of various countries and some private organizations are spending trillions dollars for the research in cancer. According to report of WHO treatment cost of cancer is approximately US$ 1.16 trillion per year and this amount is increasing per year. Despite of huge work the exact cause of genesis is still unknown. Couples of therapies like chemotherapy, radiation, surgery and targeted therapy are available with some detrimental effect. Now scientists are seeking lead molecule from naturally occurring substances due to high safety margin as compared to current approaches. Natural phytochemicals are prominent strategy for prevention, treating, and curing cancer. There are many phytochemicals from herbs having potent anticancer property. Generally these phytochemicals treat cancer by different mechanisms like augmenting apoptosis, cell cycle arrest, targeting to some specific cancer inducing proteins, increasing cytotoxicity etc. This is our little attempt to gather information of phytochemicals having anticancer property such as Etoposide, Curcumin, Vincristine, etc. with postulated mechanism. Etoposide is effective in lung cancer, ovarian cancer by inhibiting type II Topoisomerase. Various research revealed that Curcumin is effective in different types of cancers by increasing apoptosis and targeting specific gene such as MDM2 oncogene is inhibited through the ETS2 transcription factor by modulation of signaling pathway PI3K/mTOR in breast cancer. Vincristine shows anticancer property by oncogenic EWS-FLI1 fusion protein inhibition which cause G2-M phase cell cycle arrest & reduce tumor. This review depicts few phytochemicals having anticancer property such as Etoposide, Curcumin, vincristine, etc. with possible mechanism. Globally cancer is the chief inducer of death. Cancer is a condition in which abnormal rapid cell growth due to irregularity in the genome. Mutations in tumor suppressor genes which work in cell-cycle regulation are often observed in numerous types of cancer (Bukhtoyarov et al., 2015). Almost 8.8 million people succumbed due to different types of cancer such as lung cancer, liver cancer, breast cancer, stomach cancer, blood cancer etc. (www.who.int/cancer/en/). Despite of huge work the exact cause is unknown, many therapies like chemotherapy, radiation therapy, surgery and targeted therapy are available with some toxic effect. Now scientists are focusing on naturally occurring substances from plant sources having anti-cancer properties with minimum toxic effect as compared to chemotherapy. Natural phytochemicals are prominent strategy for prevention, treating, and curing cancer. There are many phytochemicals from herbs having potent anticancer property. Generally these phytochemicals treat cancer by different mechanisms like increasing apoptosis, cell cycle arrest, targeting to some specific cancer inducing proteins, increasing cytotoxicity etc. Etoposide is effective in lung cancer, ovarian cancer by inhibiting type II Topoisomerase. Various research shows that Curcumin is effective in different types of cancer like breast cancer and lung cancer by increasing apoptosis and targeting specific gene such as MDM2 oncogene is inhibited through the ETS2 transcription factor by modulation of signaling pathway PI3K/mTOR in breast cancer. (Lazaro M, 2008) Government of various countries and some private organizations are spending trillions dollars for the research in cancer. Cancer is becoming a high profile disease in developed and developing worlds. In 2007 the WHO published that in 2005, 7.6 million people died from cancer related diseases with the majority of these people living in low-income countries. In the United States cancer is the cause of 1 in 4 deaths and in 2010 it was estimated there were over 1.5 million new cases of cancer (Jemal et al 2010). Cancer Research UK said in 2012 14.1 million adults were diagnosed with cancer and 8.2 million people were killed by cancer globally (www.cancerresearchuk.org). Therefore, the demand for a cure and the prevention of cancer is extremely high. Chemically-derived drugs have been developed and other cancer treatments pre-exist . (Seidel et al 2012). However, current methods such as chemotherapy have their limitations due to their toxic effects on non-targeted tissues furthering human health problems (Ochwang’I et al 2014). Therefore, there is a demand for alternative treatments with naturally-derived anticancer agents with plants being the desired source. Increasing demand for plant-derived drugs is putting pressure on high-value medicinal plants and risking their biodiversity (Zschocke et al 2000). Increasing populations, urbanization and deforestation are contributing to species endangerment in developing countries. To aid conservation of these species germplasm conservation, cryopreservation, tissue cultures and plant part substitution strategies need to be in place (Kasagana et al 2011) . Mass cultivation of medicinal plant species and utilizing raw by-products in industries may also help with conservation. (Phillipson et al 1999) (Sahpazidou et al 2014) Plant-derived anticancer agents are effective inhibitors of cancer cells lines, making them in high demand. Exploitation of these agents needs to be managed to keep up with demands and be sustainable. This review article explains potential anticancer active ingredients from natural source. They would be least toxic and more effective than rest synthetic molecules. Till the date, no significant and systematic studies been carried out. Thus it is desirable to pursue research endeavor on these compounds and they would be brought to market in coming days. Hence millions of patients will be benefitted. 1. Azam S., Hadi N., Khan N.U., Hadi S.M., 2004 Prooxidant property of green tea polyphenols epicatechin and epigallocatechin-3-gallate: implications for anticancer properties: Toxicology in Vitro 18 555–561. 2. Aluyen J. K., Ton Q. N., Tran T,. Yang A.E., Gottlieb H. B., & Bellanger R. A. 2012 Resveratrol: Potential as Anticancer Agent Journal of Dietary Supplements, 9(1):45–56. 4. Bukhtoyarov O. V. ,, Samarin D. M. 2015 Pathogenesis of Cancer: Cancer Reparative Trap Journal of Cancer Therapy, 2015, 6,399-412. 6. Cao W., Hu C., Wu L., Xu L, Jiang W. 2016. Rosmarinic acid inhibits inflammation and angiogenesis of hepatocellular carcinoma by suppression of NF-κB signaling in H22 tumor-bearing mice Journal of Pharmacological Sciences Volume 132, Issue 2, October 2016, Pages 131-137. 9. Gordaliza M.,. Castro M.A, Miguel del Corra J.M. and San Feliciano A. 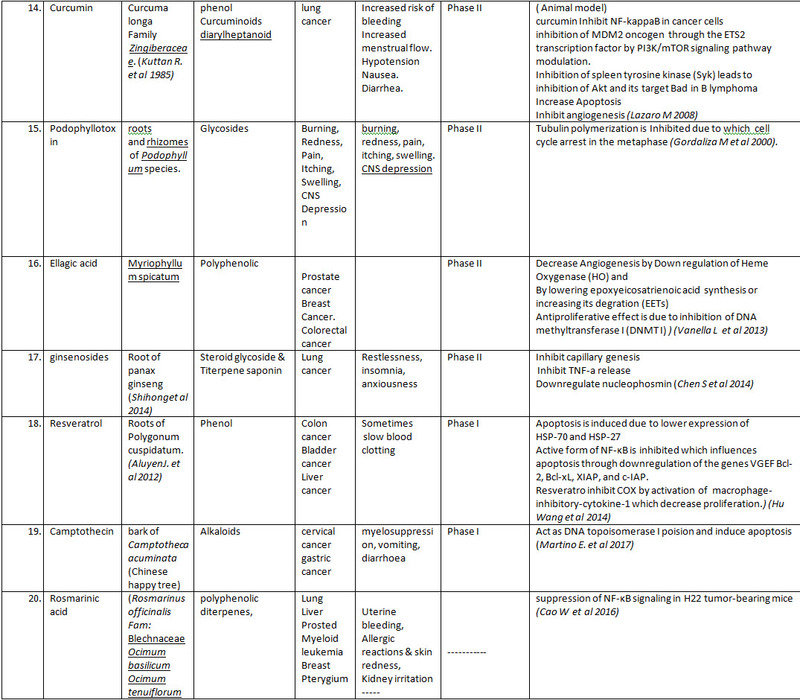 2000 Antitumor Properties of Podophyllotoxin and Related Compounds: Current Pharmaceutical Design, 6, 1811-1839. 10. Greenwell M. and Rahman P.K.S.M. 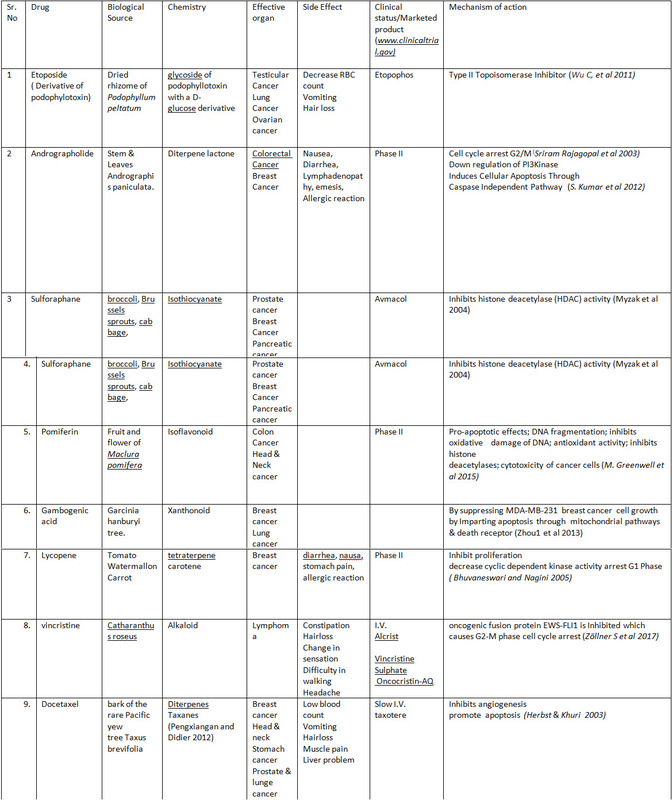 2015 Medicinal Plants: Their Use in Anticancer Treatment Int J Pharm Sci Res. Oct 1; 6(10): 4103–4112. 11. R. S. and Herbst, Khuri F. R. 2003 Mode of action of docetaxel – a basis for combination with novel anticancer agents: CANCER TREATMENT REVIEWS Vol 29: 407–415. 13. Jemal A, Siegel R, Xu J, Ward E. Cancer Statistics, 2010. CA: A Cancer Journal for Clinicians. 2010;60:277–300. 14. Kasagana VN, Karumuri SS. 2011 Conservation of Medicinal Plants (Past, Present & Future Trends) Journal of Pharmaceutical Sciences and Research. ;3(8):1378–1386. 15. Kuttan R. , Bhanumathy P., Nirmala K. And George M. 1985. Potential anticancer activity of turmeric (curclima longa) CancerLetters, 29 (1985) 197-202 . 17. Lee J. Moon M., Min H., Chung H., Park E. Park H. , Hong J. , Kimb Y ., and Lee S. , 2005 Induction of apoptosis by a novel indirubin-5-nitro-30-monoxime, a CDK inhibitor, in human lung cancer cells: Bioorganic & Medicinal Chemistry Letters 15 3948–3952. 20. Martino E., Volpe S., Terribile E, Benetti E., Sakaj M., Centamore A., Sala A., Collina S. 2017. Bioorganic & Medicinal Chemistry Letters Volume 27, Issue 4, Pages 701-707. 21. Myzak M., Karplus P. Lung C. and Dashwood R. 2004 A Novel Mechanism of Chemoprotection by Sulforaphane: Inhibition of Histone Deacetylase cancer research 64, 5767–5774. 22. Ochwang’I DO, Kimwele CN, Oduma JA, Gathumbi PK, Mbaria JM, Kiama SG. 2014 Medicinal plants used in treatment and management of cancer in Kakamega County Kenya: Journal of Ethnopharmacology. ;151:1040–1055. 23. Phillipson JD. 1999 Medicinal Plants. Journal of Biological Education (Society of Biology) ;31(2):109. 25. Rajagopal S. , Kumar A. , Deevi D., Satyanarayana C., and Rajagopalan R. 2003 Andrographolide, a potential cancer therapeutic agent isolated from Andrographis paniculata: Journal of Experimental Therapeutics and Oncology 3: 147–158,. 26. Sahpazidou D, Geromichalos GD, Stagos D, Apostolou A, Haroutouian SA, Tsarsakis AM, Tzanakakis NG, Hayes AW, Kouretas D. 2014 Anticarcinogenic activity of polyphenolic extracts from grape stems against breast, colon, renal and thyroid cancer cells: Toxicology Letters. ;230:218–224. 27. Seidel C, Florean C, Schnekenburger M, Dicato M, Diederich M. 2012 Chromatin-modifying agents in anti-cancer therapy: Biochimie. ;94:2264–2279. 30. Wang H., Khor T. Shu L. Su L. , F Fuentes F, Lee J.H. , and Kong A. N. T., 2014 Plants Against Cancer: A Review on Natural Phytochemicals in Preventing and Treating Cancers and Their Druggability: Anticancer Agents Med Chem. 2012 Dec; 12(10): 1281–1305. 31. Wu C. . Kun L. Farh L. Lin L., Lin T. , Yu-J., Yen T. Chiang C. Chan N. 2011 Structural Basis of Type II Topoisomerase Inhibition by the Anticancer Drug Etoposide VOL 333 page 459-462. 35. Zöllner S., Selvanathan S. Graham G. Commins R. Hong S., Moseley E., Parks S. Haladyna J., Erkizan H. , Dirksen U., Hogarty M. Üren A., Toretsky J. 2017 Inhibition of the oncogenic fusion protein EWS-FLI1 causes G2-M cell cycle arrest and enhanced vincristine sensitivity in Ewing’s sarcoma :Sci. Signal. 10, page 1-12. 36. Zschocke S, Rabe T, Taylor JLS, Jäger AK, van Staden J. 2000 Plant part substitution – a way to conserve endangered medicinal plants? Journal of Ethnopharmacology. ;71:281–292.